John Cira’s work is designed to elicit an experience, provoke thought, create a moment of pleasure, dilemma, or outrage. John intervenes in spaces – whether two or three dimensional – in ways that draw on the volumes of influences contained in his own personal experience with past and present masters, advanced or primitive cultures, peers and collaborators. He utilizes a range of media to keep the learning curve mobile, advanced, evolving. John Cira is a visual artist based on Cape Cod, Massachusetts, involved in the creation of site specific sculptural installations. The first installation utilizing spandex fabric began with a commission from the Fuller Museum in Brockton, MA in 2000. A successful proposal for an environmental arts exhibition resulted in the dilemma of how to mimic the tension of a giant slingshot utilizing trees as support. The solution was to use spandex. Cira became intrigued by the sculptural qualities of the material and subsequently created four additional large scale spandex installations. Gravity Revealed was the largest of these installations, commissioned in 2005 by the Heritage Gardens and Museums in Sandwich, MA. Nearly half an acre was covered by spandex creating an installation that was transparent, translucent, kinetic, reflective, tactile and illusory. Spandex installations were also exhibited at Cape Cod Community College, Bridgewater State College, and the Hyannis Harbor Art Center in the summer of 2012. John was commissioned by the Provincetown Art Association to create a floating sculpture to commemorate the 350th anniversary of the founding of Provincetown. 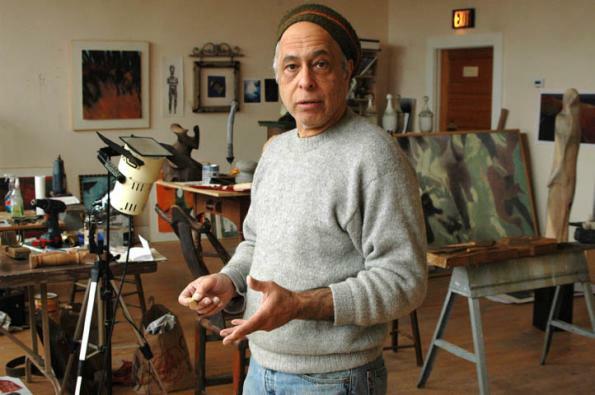 He has also installed temporary outdoor works at the Cotuit Center for the Arts. John works in various media at the Old Schoolhouse Studios in Barnstable, MA. His photo-generated altered images have been exhibited at the Provincetown Art Association and the Cultural Center of Cape Cod.